Oh wow, I've been had! Since it brought up the screen and the button said "Pay Now" I assumed it was payment on placement of order. Quickly scurried back and got them locked down. Always thought I had to preorder from Amazon as a result, happy to know that's not the case. Had no idea this was a thing, I thank you even if my future wallet doesn't. Thank you so much for asking this lol. Haha yeah, they don't take payment right away despite it saying 'pay now'. They also email you close to the dispatch date to let you know they'll be taking the money from your account soon. That's awesome info &#8211; thanks again. Feels good knowing that I can be on top of the pre-orders from Nintendo UK as and when they show up. NUK is the place I'd rather get everything from, especially as I don't typically spend more than RRP for amiibo (yet..) and is the website I track for the twitter. Just need to keep my eyes open for a WW Link and Zelda and my Zelda collection will be finished. 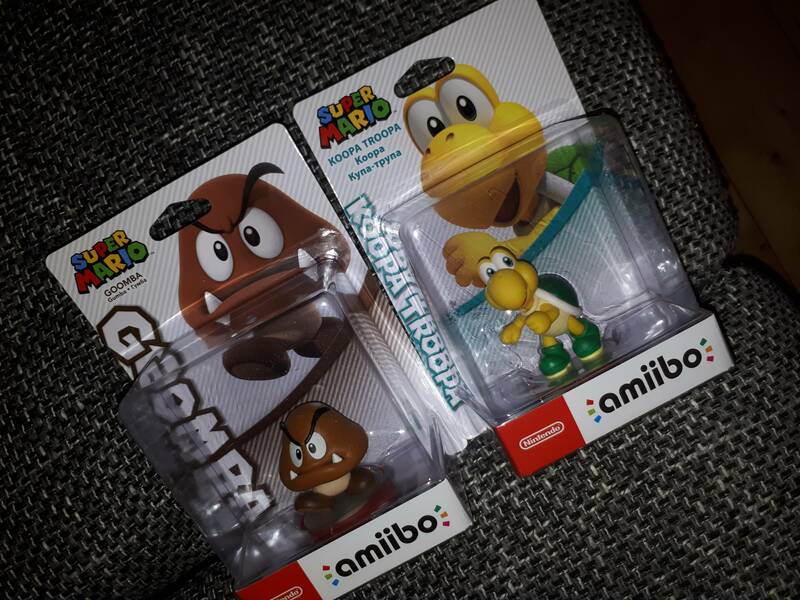 I really like the goomba and koopa ammibos which arrived today. I'm quite surprised they're not releasing various Mario enemies with taches to coincide with Odyssey coming out. Got them too. Somehow I expect them to come out with Mario Odyssey, surprised me a bit. Picked up BOTW Zelda after looking for ages. Whenever it went up in the past it was gone almost as soon as I found out. I only saw it was back yesterday and was surprised I didn't miss it! Now I'm trying to justify buying the three Mario Odyssey figures. They look so Cool! Bokoblin and Guardian amiibo are available on Nintendo UK store as well. amazonDE's price for existing orders of the Guardian Set fell from 75EUR to 68.39EUR ...stings a bit less now at roughly 17EUR per amiibo. still overpriced, though. Hey guys, if you need recommendation talking about parcel delivery services so I really recommend this: https://www.parcelabc.es/ I think they offer best price parcel delivery services, you can compare prices in their site. Has anyone heard anything when the Pearl and Marina Amiibos will be out? I'm in Canada and we haven't even had preorders available yet. Hello again, not been on GAF in months, maybe years? I'm just really upset about the rarity of the Bayonetta amiibos. The last set of fighters I didn't see in stores at all. I managed to snag a Bayo 2 amiibo by fervently checking things like HUKD and having alerts on but still really want the original look for her. I'm more upset about how this thread seems to have died a death, would it be right to surmise that the Amiibo 'craze' has now died a death by lack of activity in here? I finally bit the bullet and weighed on 39 quid for Skyward Sword Link last night so still requiring Majora's Mask Link, Corrin Player 2, Mega Man Rockman and the Gold Mega Man to have the full house. Anyone reading this able to help me out on any of them drop me a line please. Saying about high prices I was absolutely stunned to see what Cuby Box Boy Amiibo is going for nowadays so was extremely relieved that I imported him at launch however long ago that is now. Well, there hasn't been hardly anything that's come out for the switch that uses Amiibos. Even though they've got some nice looking ones coming down the stretch like squirtle, ivysaur, pokemon trainer and simon. For Majora's Mask Link it's possible they might do a reprint near the release of Link's Awakening. They just did a reprint of Wolf Link amiibo when there's really no reason to atm other than for BotW maybe? IDK kinda makes me think a switch Twilight Princess HD port might be on the way but who knows. They also just did a reprint for the botw champions to. If Fire Emblem has amiibo support than I can definitely see Corrin player 2 getting a reprint. I would have swore they did one for her when Smash Ultimate came out but I can't remember. But yeah I really wanted Ocarina of Time Link and ended up that importing that along with toon zelda from playasia. (kicks self for not getting the toon link/zelda bundle from Target) Luckily I got Majora's Mask Link and 8-bit Link for retail price while they were still around. I still need skyward sword link.